Bill payments are due by the 28th of each month. The District requires a $75.00 tenant / $75.00 owner security deposit and a non-refundable $30.00 application fee. The deposit, application fees, a completed application, and a signed Customer Service Agreement are required to set up service. The deposit will be refunded when your account is closed and paid in full. To disconnect service, please provide 24 hours notice (business days only) to the district by filling out the contact form and provide a forwarding mailing address. You may pay via credit/debit/prepaid card or eCheck. Log onto the Payment Portal to access the online payment portal. You can register your account, OR pay as a guest. For more information or assistance with registration, call EDP at (832) 467-1599, Monday – Friday, 8:00 am to 5:00 pm CST. Log onto the Payment Portal or contact PGMUD Customer Service Office at (281) 238-5000 to sign up for auto payments. You can select your payment method, enter your desired payment recurring due date (no later than the 28th) and either a fixed payment amount or amount of the current bill. Each month, you will receive an email confirming the payment was successful. If you are currently signed up for Bank Draft, please be aware that your payment will no longer be drafted. Please access the payment portal to register for the new Auto Pay services. For more information or assistance with registration, call Pecan Grove MUD at (281) 238-5000, Monday – Friday, 8:00 AM to 4:00 PM (closed for lunch from 1:00 PM to 2:00 PM). Fees charged by the service providers listed above are for the administrative costs of providing the services. 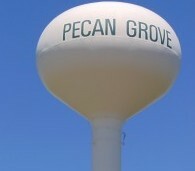 Pecan Grove MUD does not receive any portion of the service fees. Please contact the Customer Service Office if you have any questions.